Hall of Fame jockey Mike Smith tried a similar tactic to that he employed aboard Abel Tasman in the CCA Oaks, moving the Kentucky Oaks winner toward the lead about a half-mile into Saturday's Grade 1 Cotillion Stakes, but it wouldn't work a second time. It was Drayden Van Dyke aboard Tommy Town Thoroughbreds' It Tiz Well who at 5-1 was able to sweep by 4-5 favorite Abel Tasman in the stretch, scoring by two lengths and giving trainer Jerry Hollendorfer his second Cotillion in a row. A 3-year-old daughter of Arch, It Tiz Well covered 1 1/16 miles over Parx' fast main track in 1:43.67. Van Dyke kept It Tiz Well just off the pacesetters down the backstretch, allowing the filly to maintain an easy, loping stride as he tracked the movements of the other riders. Lockdown had jumped out of the gates on top, and the favored Abel Tasman was very slow into stride, winding up near the rear of the field around the first turn. After Lockdown covered the first quarter in 23 1/5 seconds, Smith seemed to feel the pace slow down a bit. He cued Abel Tasman to move up the rail, making up approximately eight lengths in less than a sixteenth of a mile. She was vying for the lead with Lockdown through fractions of 47 1/5 seconds and 1:11 1/5, leaving Van Dyke and It Tiz Well sitting pretty just behind the leading pair as Lockdown refused to let up on Abel Tasman. The battle was on down the lane as both jockeys asked their fillies to lay it on the line. A very game Abel Tasman, despite already running hard for more than a half-mile, hunkered down and fought off the challenge from Lockdown. But Van Dyke tipped wide aboard It Tiz Well at the head of the lane, and was just out of the line of sight of Abel Tasman when she rocketed to the lead. To her credit, Abel Tasman tried to rise to the challenge and re-engage toward It Tiz Well, but the wire flashed ahead with It Tiz Well two lengths in front. Abel Tasman bested Lockdown for the place, and Mopotism got up for fourth. Bred in Kentucky by Allen and Susan Branch, It Tiz Well commanded $230,000 as a yearling at the Keeneland September sale. She has since gone on to win a pair of Grade 3 races and was previously placed in two Grade 1 events, but the Cotillion is her first top-level score. Overall, It Tiz Well's record stands at 5-2-2 from 10 starts, with earnings of over $1.1 million. 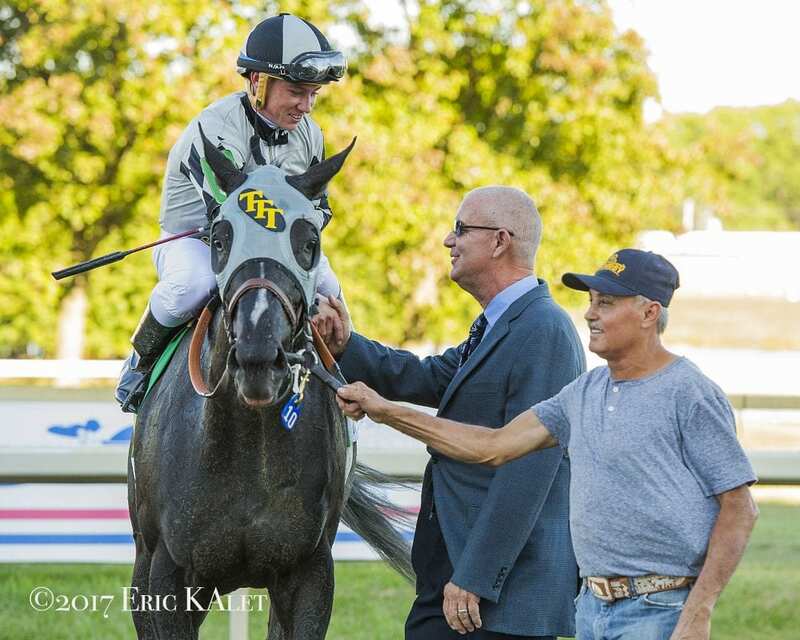 This entry was posted in NL Article, Racing and tagged Abel Tasman, Arch, Bob Baffert, Cotillion, Cotillion Stakes, drayden van dyke, it tiz well, jerry hollendorfer, lockdown, mike smith, parx, Parx Racing, Quality Road, tommy town thoroughbreds by Paulick Report Staff. Bookmark the permalink.